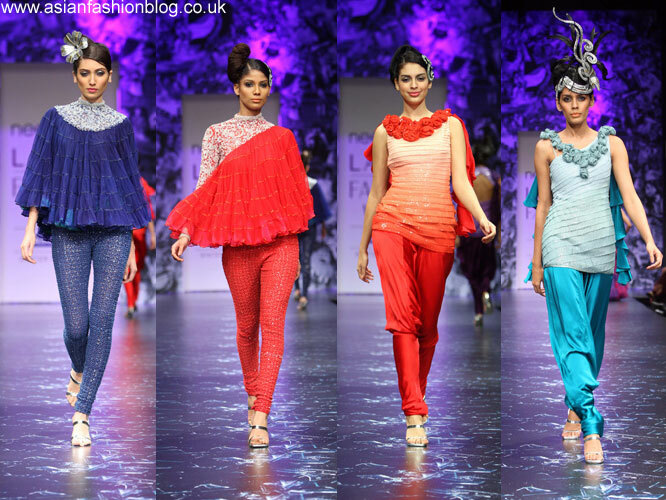 I last wrote about Neeta Lulla when she showcased a collection for London's RCKC at the Asiana Elite Bride Show earlier this year. Seeing as that event was a wedding show all the looks were very bridal, here are some very different looks which were on show at the Winter Lakme Fashion Week last month as part of Neeta' 2010 Silver Jubilee line. Some of these dresses are a little over the top with all the frills and tulle (I'm talking about the red and pink dresses in particular!) 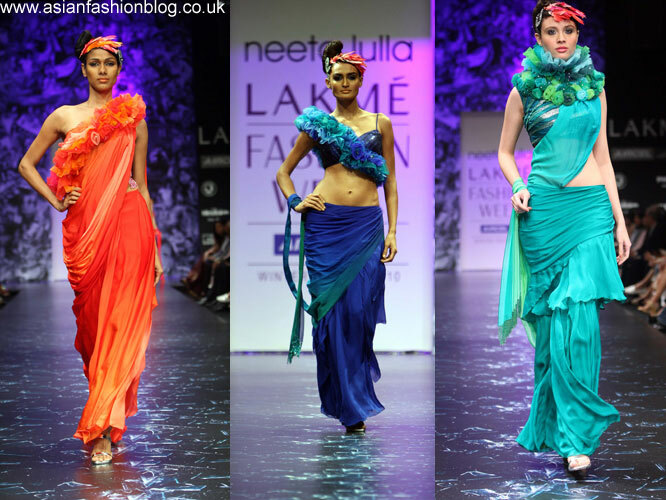 but let's not forget Neeta Lulla is also a costume designer and I think the drama and funky head-pieces work! More drama and costume-styles ended the show, including this big-collared red and purple outfit above which looks very regal! 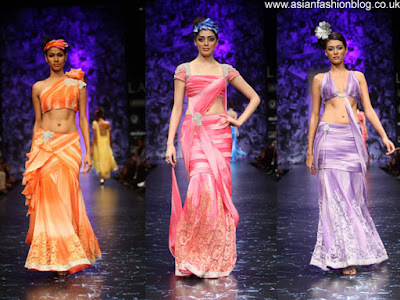 Finally, instead of getting the latest hot young thing in Bollywood on the catwalk, Neeta went old school and dressed actress Sridevi to walk down the catwalk with her. I almost couldn't believe it was her when I saw this photo, I've not seen a close-up but from this distance she looks gooooood! As for the dress, well some other LFW commenters/bloggers have described it as a "space suit" but I don't think it looks that bad. I'd say it's a bit of a contrast to see a flat block colour after all the mixed tones/panels/ruffles already seen on this catwalk. What do you think of the collection and this final star outfit? Photo credits go to the official Lakme Fashion Week website where you can view more photos from this event. I like the last images shown on your article. The grey color dresses so simple and elegant. 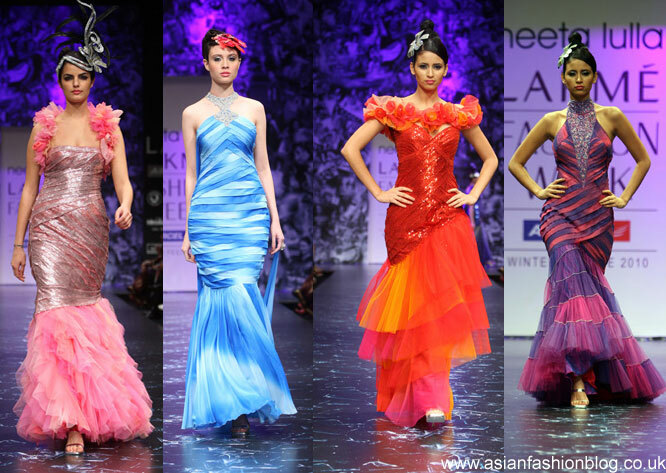 So much colour on the catwalk, the silver dress is a show stopper! Oh wow, Sridevi is looking HAWT. I think she carried that dress of beautifully.